Columbus Museum of Art’s annual holiday celebration of the creative potential of LEGO® bricks returns. Bring your friends and family and celebrate the season by connecting with LEGO® and each other. Think Outside the Brick features an enormous collaboratively-built model of Columbus. 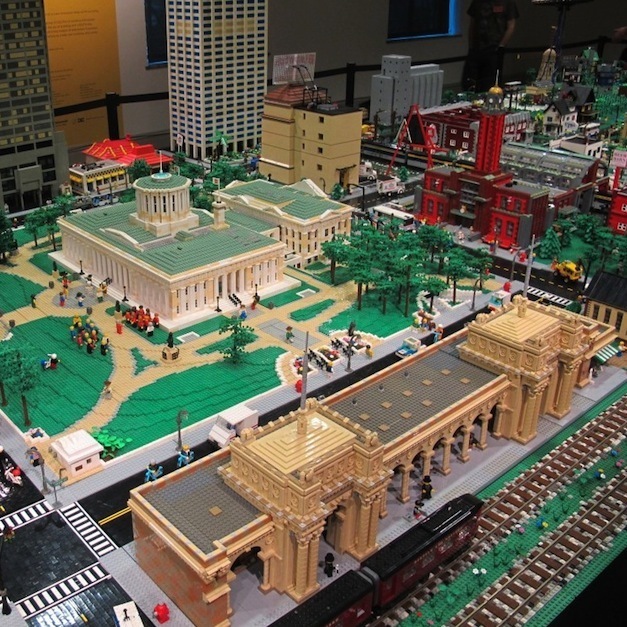 You’ll find familiar landmarks and imaginative creations – all constructed by the members of OhioLUG, a group of adults that have (re)discovered the joy of building with LEGO®. New this year, enjoy Ohio State themed Buckeye art. Check out our Imagine the Possibilities wall in the Chase Center for Creativity, which is filled with LEGO® sculptures created by CMA visitors. Use the building bricks provided to create your own LEGO® design. Artists are encouraged to post their creations on the Imagine the Possibilities wall and on social media. Compete in fast-paced creative challenges using LEGO® bricks. A new round of competition will be held every 30 minutes between 1:00 and 4:00 PM, and prizes will be awarded to each round’s winning team. Cost of this program is included with general museum admission, no registration requested. Cost of all LEGO® events and programs is included with general museum admission.